Post demonetisation, one segment of the market which has benefited in terms of flow of money is mutual funds. The money that came in banks had to be p arked in avenues which give reasonably good returns than fixed deposits. This catapulted flows into v a r i o u s m u t u a l f u n d s c h e m e s.
According to the Association of Mutual Funds India (AMFI), total inflows in mutual funds across equity, balanced and equity ELSS categories since January 1, 2017 were Rs. 1,00,325 crore. 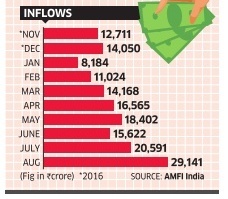 Mutual fund distributors observe that close to 50% of these inflows have been parked in balanced funds. This is followed by 25% each in equity savings schemes and in large-cap, mid-cap and multi-cap schemes. This diversification is helping savvy investors especially HNIs protect the downside risk to their portfolio. This diversification is a marriage of best of almost all categories in mutual funds besides taking into account the tax benefits also. Balanced mutual funds provide the best of equity and debt while equity savings schemes is a mix of equity , debt and arbitrage schemes. Equity savings schemes invest 30% to 35% of the portfolio in equities and the remaining in debt and arbitrage. 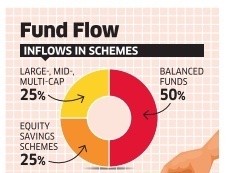 This structure provides comfort to new investors as the possibility of fall in returns of these schemes is quite low given its diversification.